Overall, we had a great event! We had 10 vehicles, 3 Tesla Model S's, 3 Tesla Model 3's, 1 Honda Clarity, 1 Nissan Leaf, 1 Fiat 500 E and a Zero Electric Motorcycle. Combined we traveled more than 150,000 electric miles and we had attendees from as far away as Fredericksburg, Richmond, Williamsburg, Norfolk and Virginia Beach. Unfortunately, weather did have an effect on our event. There was a 90% chance of thunderstorms forecasted all week and even on the day of our event which I'm sure kept many people away. Thankfully, the weather did hold out until the end of our event. Because there is a future event in Virginia Beach, we were able to pass along our leftover marketing materials to that event and reduce our overall footprint and budget required to host multiple events in our region. A great time was had by all and dozens of people learned more about driving electric across our community! 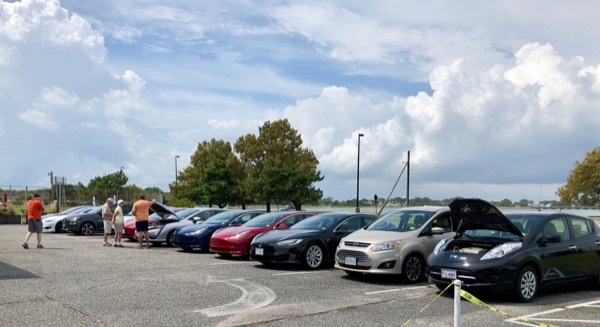 The peninsula of Hampton Roads will kick off its first ever celebration of National Drive Electric Week with a display of electric vehicles at The Oozlefinch Craft Brewery in Historic Fort Monroe. Oozlefinch is conveniently located off of Interstate 64 in Hampton, Virginia near the Hampton Roads Bridge Tunnel. Registered attendees report 120,550 electric miles driven.